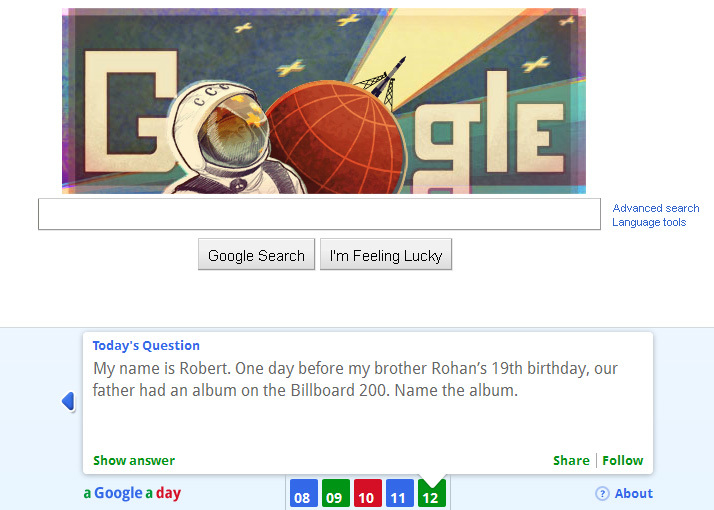 This week, Google announced the launch of the new Google-based trivia game, in collaboration with the New York Times. Users don’t have to be subscribers of the New York Times to take part of the fun, for Google has set up a site for the game at agoogleaday.com. “Traditional trivia games have a rule that you can’t cheat—you can’t look things up in books, you can’t ask your friends and you certainly can’t ask Google. But what if there were a trivia game where you could not only ask Google, but were encouraged to do so? Imagine how difficult the questions would need to be with the power of the world’s information at your fingertips,” writes Dan Russel, Google User Experience Reasearcher in the Google’s official blog. “To prevent spoilers from appearing as you search the web, look for the answers on agoogleaday.com instead of regular google.com—we’ve made a special version of Google that excludes real-time updates and other things that are likely to include spoilers as people post the answers to the puzzle online,” Russel added. Now, get ready to be Google-stumped.